It was 1999 and Leo Gorenstein and I were leaving again for Asia. George was considering publishing the whole of the CASE tests in Substance. He gave Leo a copy of the math portion. What a pitiful test. 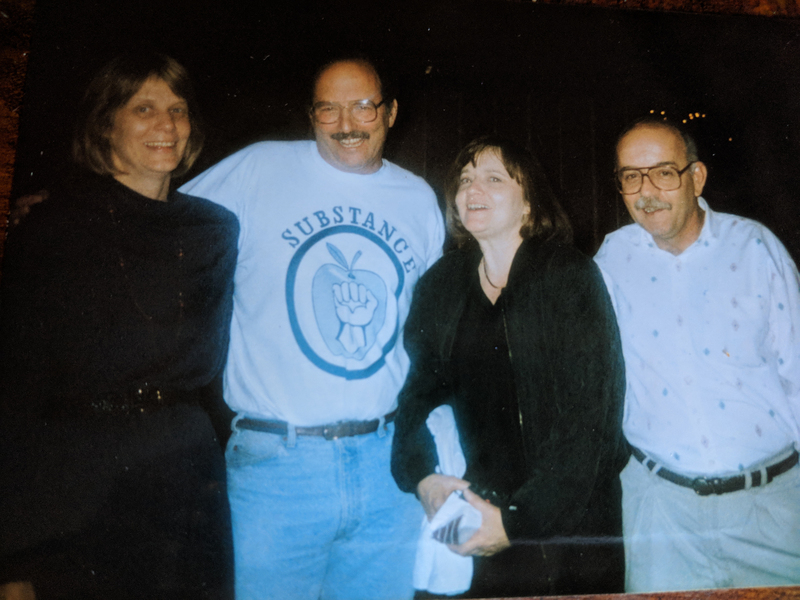 Reporter Sue Carrel's husband Leo Gorenstein, an editor of Substance (in the Substance shirt), died on April 2, 2018, of Lou Gehrig's disease. He is pictured with Chris Johnson, Terry Czernik, and Larry MacDonald in the 1990s. All had worked on Substance, beginning in the 1970s.Leo gave it to travelers while abroad. There was a business woman who failed it, a journalist who barely passed and a young woman who was a statistics major we met while hiking the Annapurna Circuit in Nepal. She, of course, passed it, but said, "Wow, this is hard! I can't believe it was given to high school freshmen!" Leo wrote the story, George published it and the rest of the tests and paid the price, losing his teaching job. 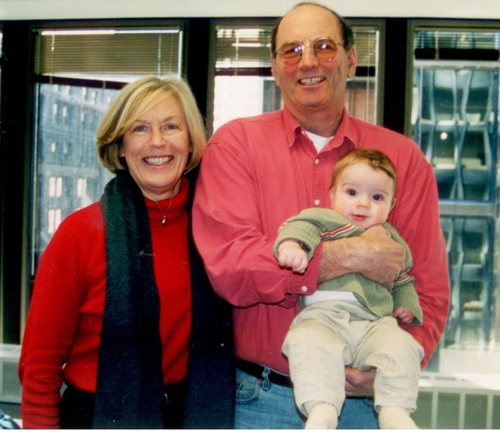 Sue Carrel and Leo Gorenstein (with Sam Schmidt) in federal court during one of the CASE hearings, 2002.I have met few people ( actually no one else!) in my life whose morals are unshaken, even if it means jeopardizing career, family and friends. George was the one. We need George Schmidts in this world, especially now...they are few and far between. The latest news about Paul Vallas was a few days old when George Schmidt came a-calling. 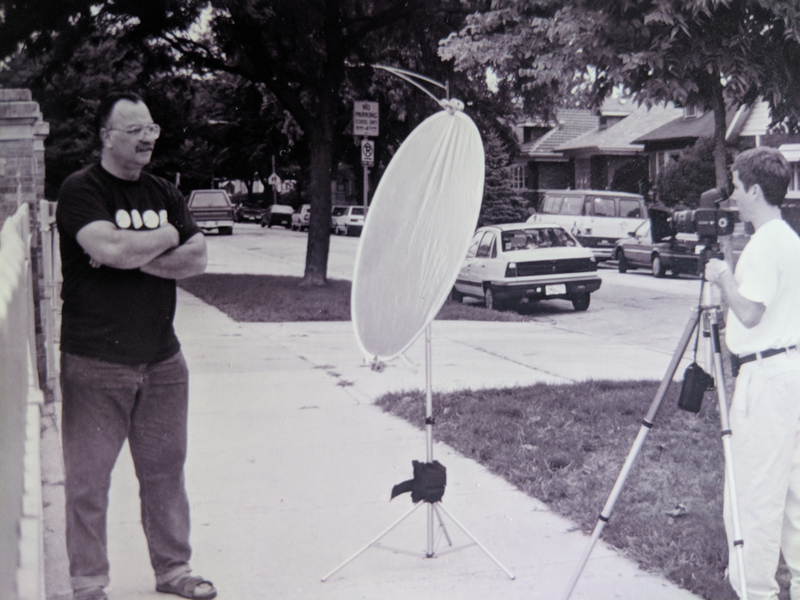 George Schmidt being photographed for an article by Michael Miner in the Chicago Reader in July 1998. Before and after the CASE publication in January 1999, George was regularly featured in the Reader, by Miner and Ben Joravsky.I wasn't surprised to hear from him. Way back in the 90s and early aughts, Paul Vallas—Mayor Daley's hand-picked school CEO—did what he could to make Schmidt's life miserable. So it was Schmidt's turn to gloat—just a little. "You hear what happened to Vallas?" Oh, yeah. A judge had removed Vallas from his position as superintendent of schools in Bridgeport, Connecticut, because he didn't have proper certification. If that wasn't bad enough—"Vallas had the nerve to compare himself to Michael Jordan," said Schmidt. "It's true," said Schmidt. "He said that removing him as superintendent because he doesn't have the right certification is 'like saying Michael Jordan can't coach basketball because he doesn't have teacher certification.'" Sure enough, I tracked down the clip in a bit by an education writer named Hugh Bailey, who clearly knows a thing or two about basketball. So, first we have Mayor Emanuel prematurely killing off Bobby Hull, one of hockey's greatest players. And now we've got Vallas foolishly comparing himself to the greatest basketball player—ever. Hey, politicians—do everyone a favor and stop talking about sports without at least running it by someone who knows a little something about the subject. Back to Schmidt . . . These days he works for the Chicago Teachers Union and publishes Substance, a muckraking paper that takes great delight in mocking, maligning and taunting the top brass at CPS. Back in 1999, he was an English teacher at Bowen High School and published Substance, which took great delight in mocking, maligning and taunting the top brass at CPS. It's good to know that some things haven't changed. On January 20, 1999, Schmidt published portions of the Chicago Academic Standards Examinations, a multiple-choice standardized test that Vallas and Mayor Daley were forcing high-schoolers to take. As if adolescence wasn't bad enough. By printing portions of the test, Schmidt exposed it as a stupid and confusing waste of money, time and energy. Of course, Daley and Vallas didn't exactly see it that way. They fired Schmidt and sued him for $1.4 million, on the grounds that he had infringed on the board's copyright by publishing portions of the test. If you're interested, read all about it. Furthermore, they argued that they'd have to spend thousands to create a new CASE test cause the old one was ruined on the grounds that by publishing it Schmidt had given away the questions. Even though knowing the questions is not the same thing as knowing the answers, as any test taker can tell you. And it would take the most enterprising of students to track down the answers to questions that may or may not be on future tests. And even though . . .
That legal battle raged for almost six years. When it was over, it was like a split decision. CPS got to fire Schmidt. But CPS had to drop all of its claim for compensation. "They went from $1.4 million to zero," says Schmidt. Here's the kicker. In 2002, CPS stopped giving the test after teachers at Curie High School rose up angry and said they wouldn't waste their time making kids take it. By then Daley had ousted Vallas and replaced him with Arne Duncan, who didn't have any ego staked in the CASE test. And so Duncan quietly killed the test—for which a grateful city says: thank you, Arne! So you see, young teachers, the episode shows that top-down ultimatums by egomaniacal autocrats is not something that began with Mayor Emanuel. An observation that may or may not offer you a little comfort as you face whatever foolishness the mayor has up his sleeves for the coming year. In retrospect, Vallas and Daley would have saved everyone a lot of time, money, and energy had they just admitted that Schmidt was right and that the test wasn't worth the paper it was printed on. But, alas, then as now, being the boss means you never ever admit you're wrong. I asked Schmidt who, in his opinion, was worse for Chicago's schools—Mayor Emanuel or Vallas. Despite all the misery Vallas caused for him and his family, Schmidt didn't have to pause to think about his answer. He's got a point. For all it's flaws, the CASE test was a temporary imposition. The fallout from closing 50 schools will go on for years.